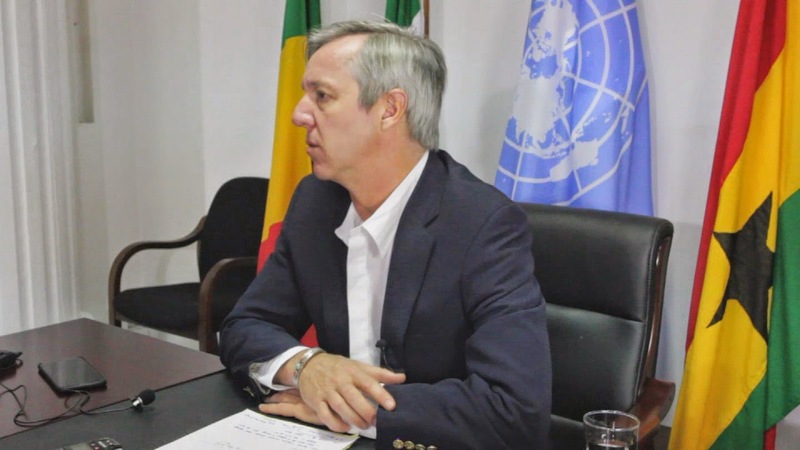 Accra, Ghana: Addressing his last presser, the outgoing head of UN's Ebola mission - Anthony Banbury pointed to significant progress in tackling the outbreak. In a final review of progress in the fight against Ebola as he prepares to hand over the role to his successor, Ismail Ould Cheikh Ahmed of Mauritania on Saturday, Banbury said, "Given where we started 90 days ago, given where the predictions were of what we might be facing, I think we have to say that the global response to the Ebola crisis has been extremely successful during this past ninety days." He reminded journalists during a press conference in Accra that 1.4 million cases of Ebola were expected by the start of the year, while in reality a total of around 20,000 cases have been reported. The goal though, he stressed, remains reaching zero cases. He said, "It's going to be extremely hard for us to bring it down to zero, but that is what we will do. That is the only acceptable outcome. Anything short of that will be failure. But we will succeed; the world will succeed in ending Ebola. He said the recorded cases are about 1.4% of what was being projected as a possibility by credible scientists back in September. He said, "As we get to lower and lower number, which I am confident we will do relatively in early 2015, we will see the numbers go down and down, but two cases here, three cases there, presents a grave threat to the population of any community or country." Returning from a final review mission in Guinea, Liberia and Sierra Leone, Banbury, who was appointed in September, pointed out that with support from UNMEER and other partners, the three countries now also have sufficient capacity to isolate and treat 100 percent of confirmed Ebola patients and enough burial teams to ensure safe and dignified burials for 100 percent of all deaths due to Ebola. Banbury, however, said several challenges remain. He said, "We need the truth, we need to have better information coming from these remote locations so we can have that early detection and then have the quick response. So going forward, those are going to be two of the highest priorities, getting the truth, having that information, and having the people on the ground to respond when we have that information." Banbury commended the role of UNMEER and other UN agencies, in particular the men and women working for them.